THE CANADIAN PRESS -- VANCOUVER - In this world of multimillion-dollar athletes and badly behaved celebrities, it comes as no surprise to Lorne Davies that three decades after his death, Terry Fox remains one of the country's most recognizable heroes. The athletics director at Simon Fraser University when Fox was a junior varsity basketball player who lost his leg to cancer, Davies remembers watching the young man return to the gym after his right leg was amputated above the knee. He'd decided to take up wheelchair basketball, and from his office Davies could see Fox spend hours practising. "He'd shoot a basketball and he'd go roll after it and pick it up, go back and shoot again, shoot and roll, shoot and roll. To see him all by himself in a gymnasium like that was quite inspiring," said Davies, now the director of the Terry Fox Humanitarian Award Program, a national program which provides dozens of scholarships across the country to students who give time to charitable work. Fox eventually did play on a wheelchair basketball team, and his team won the national championship that year. Then he decided to train for a marathon. "I don't say this to criticize anyone but... we really lack heroes for young people in this country," Davies said. Most people can name several sports icons and celebrities, but struggle to come up with "somebody who's given something to help others." Fox, who was 18 when he lost his leg to cancer in 1977 and three years later began his Marathon of Hope to raise money for cancer research, certainly did that. He dipped his leg into the cold water of the Atlantic Ocean to begin his cross-country run on April 12, 1980. For the next 143 days, Fox ran a marathon a day — 42 kilometres — from St. John's, NL, to just outside Thunder Bay, Ont. It's an incredible athletic feat for any athlete. For a cancer survivor amputee, it was enough to spark the imagination of a nation. But near Thunder Bay, the Marathon of Hope came to an abrupt and devastating end. On Sept. 1, 1980, 5,373 kilometres into his journey, with less than half way left to go, he found out the cancer had returned and spread to his lungs. Fox himself was shocked. "I thought that the cancer, that I had it beat. It was an unbelievable shock to me yesterday to find out what I had," he told reporters after the run ended. "You know I've been running 26 miles a day, up and down those hills and I've been feeling great. And I just, I didn't expect that at all. I've come so far," Fox said in an emotional interview. He died in the Royal Columbian Hospital, in New Westminster, B.C., on June 28, 1981. For those who shed tears early that morning as news spread that Fox's struggle had ended, it seems impossible that three decades have passed. The image of him, with his unique gait, running along the TransCanada highway remains fresh in their minds. "To me, everything is clear. It could have happened yesterday," said Leslie Scrivener, a writer for the Toronto Star who spent time on the road with Fox, and later wrote the biography, "Terry Fox: His Story." She can still picture the first time she saw him along the highway near the Quebec-Ontario boundary. "I can see the line of poplar trees behind him; I can see him running and how small he looked on the road; I can see him lifting his hand when I honked the horn, to say hi. Of course, he didn't stop," Scrivener said. She recalls him quite literally running into his mother's arms when her newspaper flew Betty and Rolly Fox out for a visit in July. "While she was extremely worried about Terry it was still exciting because her son was on this tremendous adventure," Scrivener recalled of Betty, who died last week. "Who wouldn't want a son who was giving back and to be such a tremendous role model for others?" While no one could have foreseen where the run would ultimately take him, Fox did seem to appreciate the incredible journey he was on. "He remembered ordinary Canadians on the road, he remembered what he'd seen and it all had a place in his heart and he didn't forget it," Scrivener said. "When he was in Newfoundland and he said 'I remember going through Gander and seeing kids playing road hockey. And where are those kids now? Are they still playing road hockey? Are they playing it in a rink? I think about that all across Canada. What are the people doing in the little towns, the people that I met?' It meant so much to him," she recalled with emotion. After they parted company, Scrivener returned to her apartment in Vancouver, looking forward to seeing him dip his foot in the Pacific at the end. "For certain, I would be there in British Columbia, on the west coast of Vancouver Island and again as he made his triumphant entry into Stanley Park. He made you believe that — that he would succeed. I mean he made an 8,000-kilometre run seem possible, because of who he was." It was not just Fox, but his family, said Davies. "It's been my belief that without his mother and without his father and the family, I don't think the run would be where it is today," he said. The family started the foundation and steadfastly guarded Fox's legacy, especially Betty. 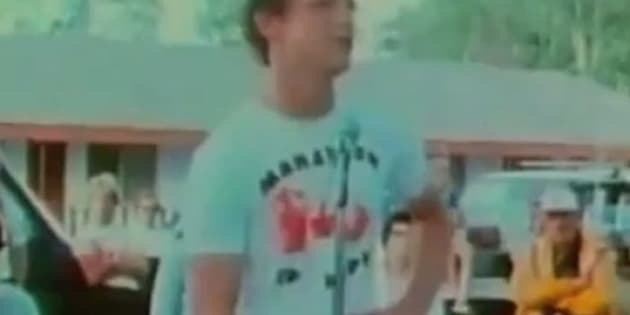 The first annual Terry Fox Run took place just a few months after his death. Today, runs take place in 28 countries around the world, and the Terry Fox Foundation has raised more than $550 million for cancer research. Thousands attended Betty Fox's memorial service on the weekend.